President Paul Kagame (R) at the BPR Atlas Mara Brand Reveal with Bob Diamond (C) and Ashish Thakkar (L) during the World Economic Forum on Africa, Kigali, in May 2016. Global payments firm Visa and Atlas Mara Limited that bought two of some of Rwanda’s biggest banks, have signed a commercial partnership to introduce new payment solutions and expand access to electronic payments within the Sub-Saharan Africa region. Atlas Mara’s banks will be able to leverage already existing Visa payment platforms, such as mVisa and Visa Direct, to provide their customers new ways of transacting that are convenient, and secure, said the two parties in a statement on Thursday. Last year, Atlas Mara Limited purchased of a majority stake in Banque Populaire de Rwanda (BPR), and merged it with BRD Commercial Bank. 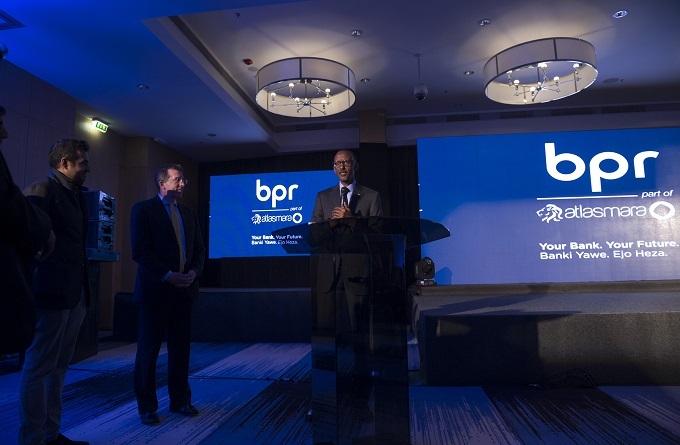 BPR, the name of the combined entity, became Rwanda’s second largest bank by assets estimated at more than $325 million. It has the largest distribution of branches. Atlas Mara Limited is listed on the London Stock Exchange as a private equity fund – owned by former Barclays Bank executive Bob Diamond and Rwandan-Ugandan entrepreneur Ashish Thakkar.